How to download DramaFever videos to playback offline on Windows or Mac? Easy to download and convert your favorite drama and favorite episode to enjoy anywhere and anytime. If you find a list of dramas from DramaFever and would like to enjoy videos offline, you must be searching for the best solution to download DramaFever videos. This article will show you a powerful DramaFever Video Downloader - Bigasoft Video Downloader Pro and a detailed guide on how to download videos from DramaFever on Win and Mac. DramaFever, a video streaming websited, allows you to watch unlimited Korean dramas, telenovelas, TV shows and movies for free. However, there is no button or anything on the page where it indicates download for playback offline. If you want to download these Asian dramas from DramaFever, a powerful streaming downloader is necessary. Acting as one of the top ranked DramaFever Downloader and Recorder chosen by millions of people, Bigasoft Video Downloader Pro helps to download DramaFever videos and convert the dramas to playback on your media device, like iPhone, iPad, Android or Windows OS tablets or phones. Please follow the steps below to download DramaFever videos to enjoy anytime and anywhere. How to download videos from DramaFever? Firstly, download and install the ideal DramaFever Downloader - Bigasoft Video Downloader Pro. There are two different versions for Windows and Mac users separately. More than 100 video streaming/sharing sites are supported, including YouTube, Facebook, Failymotion, Vimeo, Livestream, VEVO, Vine, etc. Batch download videos and playlist from DramaFever and other sites at up to 10x normal download speeds. Batch convert dramas to widely used video/audio formats, like MP4, AVI, MOV, MKV, WMV, 3GP, FLV, WEBM, MP3, M4A and more. Compatible with Windows 10/8/7/Vista/XP (32-bit and 64-bit) , Mac OS X 10.6-10.11. Provide editing functions for trimming the play time, increasing or decreasing the volume, merging F4F and F4M files, converting local media files. Go to the DramaFever.com video page or YouTube DramaFever channel and copy the URL of the video you wish to download. Then turn to the Download panel of Bigasoft Video downloader, and it will paste the copied URL of DramaFever video to the URL box. Click "Save Folder" button to choose the destination folder for the downloaded DramaFever video. To download and convert DramaFever to portable device friendly audio format, select H.264 MP4 as output format from profile drop-down menu. After all settings are done, click "Download" button to start the DramaFever video downloading. Right-click the item in Activity panel and choose "Locate Downloaded File" to get the downloaded DramaFever videos. 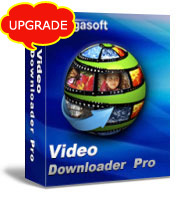 Besides DramaFever, Bigasoft Video Downloader Pro supports downloading video from more than 100 video sharing and streaming sites. If you prefer to capture live events, please open this guide to find "How to record streaming videos".